They aren’t, at least no more so than the rest of us. …I’ve come to be increasingly baffled by the high degree cynicism and immorality displayed in big-time politics. For example, Senators who genuinely do believe that carbon dioxide emissions are contributing to a global climate crisis seem to think nothing of nevertheless taking actions that endanger the welfare of billions of people on the grounds that acting otherwise would be politically problematic in their state. In other words, they don’t want to do the right thing because their self-interest points them toward doing something bad. But it’s impossible to imagine these same Senators stabbing a homeless person in a dark DC alley to steal his shoes. And what’s more, the entire political class would be (rightly!) shocked and appalled by the specter of a Senator murdering someone for personal gain. Yet it’s actually taken for granted that “my selfish desires dictate that I do x” constitutes a legitimate reason to do the wrong thing on important legislation. The knee jerk, cynical response is to mutter that they are just bought off by the campaign donors to whom they must cater. But that doesn’t provide the explanation Matt seeks. Most politicians would not actually kill someone because their campaign donors want them dead. So why do they allow their parochial interests to overwhelm their moral judgment on big issues like climate change legislation where the welfare of millions is at stake? Another cynical response is that people who are excessively power hungry or greedy self-select as politicians—so they lack a moral conscience to begin with. But that doesn’t explain why they would not consider murder but routinely allow millions to die because of their policies. Moreover, the premise is flawed. Congresspersons don’t have much power as individuals, except for the few who become committee chairs or party leaders which takes a very long time. And although some parlay their stint in office into lucrative lobbying gigs, I suspect only a few get fabulously rich. It’s not a bad job but given the obstacles to gaining office and the arduous task of continually campaigning it isn’t obvious it is a straightforward way of gaining riches or power. They may possess some other peculiar characteristic such as a narcissistic personality or an excessive need for approval but that wouldn’t preclude them taking credit for sweeping legislation that saves lives rather than small-bore catering to local interests. I don’t think any of the cynical explanations work. Rather, the explanation is that sustaining a concern for the welfare of distant, unknowable others is hard. Such a concern is not regulated by a personal relationship and it is neither concrete nor immediate. In short, it requires, not only abstract thinking, but a kind of sustained caring that lacks an immediate emotional tug. On issues such as climate change, much of the threat lies in the future. We don’t know precisely who will be harmed or when they will be harmed or to what extent. And responsibility for these harms will not fall on a single person but will be distributed across thousands of people who could have halted climate change but did not. It is a fact about human psychology that people typically discount the future, exaggerate uncertainty, and avoid responsibility when it is diffuse. Causing statistically predictable death is not like causing an actual death. In contrast to preventing climate change, killing a person involves immediate, personal contact, and full responsibility for a result about which one is virtually certain. There are powerful psychological impediments to committing murder that disappear when contemplating temporally remote “statistical harm”. So politicians fail to concern themselves with the common good because they are, like most of the rest of us, concerned with the personal, the palpable, and the concrete. And politicians if they are to stay in power must signal to their constituents that they share their values (and moral psychology). Most people frame moral questions in personal terms and emphasize local concerns. So do politicians. When you have citizens who refuse to use energy saving, compact fluorescent light bulbs because they don’t glow as warmly as incandescent bulbs, it is apparent that the problem is not with the politicians only. And we are probably limited in our moral imaginations because evolution designed us to focus our practical reason on immediate, local concerns. This is the challenge that liberalism confronts in tackling long-term, global problems. It requires a kind of moral and intellectual commitment that most people find unfamiliar at best and threatening at worst. 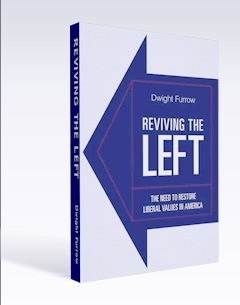 It was in part a desire to provide a solution to this challenge that motivated me to write Reviving the Left. I suspect Matt thinks this way because he has a background in philosophy and because he strikes me as a bit of a utilitarian. Making abstract, impersonal judgments is part of the territory. But I don’t think the practical reason of most human beings works that way. I think the underlying issue is one of the most profound ones humanity faces so I don’t think I have it all figured out. No one does, but we better get it figured out–quickly.